A miniature and accurate meter for the distance, area and volume of rooms. Excellent, small, convenient and the main accurate measure of distance, area and volume of rooms. Immediately makes measurements and displays the results. I think for the needs of a simple user is the ideal solution. Good product in some ways, fairly easy to figure out and use. But the main measuring button is hard to press, which ends up making the laser move around a lot when you try to do a measurement. 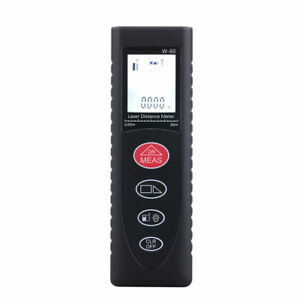 This great handheld laser distance meter was a positive surprise to me. I needed a tool for precise measurement for my house measurement and modelling the floor plans. this distance meter is close to perfect when comparing to the metal ruler and with this info it means that this is precise for professionals. The price is great and for this quality product this means I will order two more for future use. The best out there for its price. It works well. At night it can hit up to 50 meters (if you can keep it stable), the day it's not so good (like every laser). The one think i do not like is that there is no hole for docking it on a tripod. Very cheap and it works! PROS: Excellent price for what you get. CONS: Its cheap on its materials and feels like it. A little light on hand too. Its perfect for what i got it for: an inexpensive distance meter to have as a spare in car and in the bag of coworkers.